BackgroundSedation with α2-agonists in the horse is reported to be accompanied by impairment of arterial oxygenation. The present study was undertaken to investigate pulmonary gas exchange using the Multiple Inert Gas Elimination Technique (MIGET), during sedation with the α2-agonist detomidine alone and in combination with the opioid butorphanol.MethodsSeven Standardbred trotter horses aged 3–7 years and weighing 380–520 kg, were studied. The protocol consisted of three consecutive measurements; in the unsedated horse, after intravenous administration of detomidine (0.02 mg/kg) and after subsequent butorphanol administration (0.025 mg/kg). Pulmonary function and haemodynamic effects were investigated. The distribution of ventilation-perfusion ratios (VA/Q) was estimated with MIGET.ResultsDuring detomidine sedation, arterial oxygen tension (PaO2) decreased (12.8 ± 0.7 to 10.8 ± 1.2 kPa) and arterial carbon dioxide tension (PaCO2) increased (5.9 ± 0.3 to 6.1 ± 0.2 kPa) compared to measurements in the unsedated horse. Mismatch between ventilation and perfusion in the lungs was evident, but no increase in intrapulmonary shunt could be detected. Respiratory rate and minute ventilation did not change. Heart rate and cardiac output decreased, while pulmonary and systemic blood pressure and vascular resistance increased. Addition of butorphanol resulted in a significant decrease in ventilation and increase in PaCO2. Alveolar-arterial oxygen content difference P(A-a)O2 remained impaired after butorphanol administration, the VA/Q distribution improved as the decreased ventilation and persistent low blood flow was well matched. Also after subsequent butorphanol no increase in intrapulmonary shunt was evident.ConclusionThe results of the present study suggest that both pulmonary and cardiovascular factors contribute to the impaired pulmonary gas exchange during detomidine and butorphanol sedation in the horse. 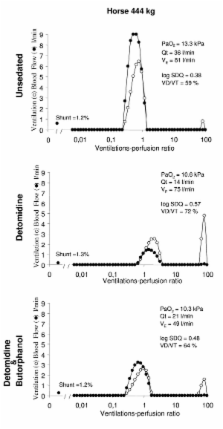 A new method has been developed for measuring virtually continuous distributions of ventilation-perfusion ratios (V(A)/Q) based on the steadystate elimination of six gases of different solubilities. The method is applied here to 12 normal subjects, aged 21-60. In nine, the distributions were compared breathing air and 100% oxygen, while in the remaining three, effects of changes in posture were examined. In four young semirecumbent subjects (ages 21-24) the distributions of blood flow and ventilation with respect to V(A)/Q were virtually log-normal with little dispersion (mean log standard deviations 0.43 and 0.35, respectively). The 95.5% range of both blood flow and ventilation was from V(A)/Q ratios of 0.3-2.1, and there was no intrapulmonary shunt (V(A)/Q of 0). On breathing oxygen, a shunt developed in three of these subjects, the mean value being 0.5% of the cardiac output. The five older subjects (ages 39-60) had broader distributions (mean log standard deviations, 0.76 and 0.44) containing areas with V(A)/Q ratios in the range 0.01-0.1 in three subjects. As for the young subjects, there was no shunt breathing air, but all five developed a shunt breathing oxygen (mean value 3.2%), and in one the value was 10.7%. Postural changes were generally those expected from the known effects of gravity, with more ventilation to high V(A)/Q areas when the subjects were erect than supine. Measurements of the shunt while breathing oxygen, the Bohr CO(2) dead space, and the alveolar-arterial oxygen difference were all consistent with the observed distributions. Since the method involves only a short infusion of dissolved inert gases, sampling of arterial blood and expired gas, and measurement of cardiac output and minute ventilation, we conclude that it is well suited to the investigation of pulmonary gas exchange in man. Measurement of continuous distributions of ventilation-perfusion ratios: theory. Copyright statement: Copyright © 2009 Nyman et al; licensee BioMed Central Ltd.
Effect of pulmonary hypertension on gas exchange. Pressure controlled-inverse ratio ventilation and pulmonary gas exchange during lower abdominal surgery. Hemodilution during venous gas embolization improves gas exchange, without altering V(A)/Q or pulmonary blood flow distributions.